Hi there. I was interested in adding a cleaner wrasse to our 125 gallon tank. We've only started this hobby and haven't yet populated our aquarium but we heard that the cleaner wrasse will starve once the parasites have all been cleaned up. If so is there anything we can feed it once the aquarium and its inhabitants are parasite free? Is it possible to have a parasite free aquarium or will it always have something to feed on. In a 125g, you probably have quite alot of fish. 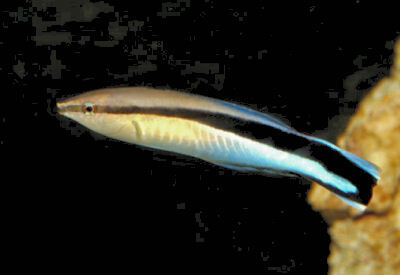 If you are talking about the "regular" cleaner wrasse usually "Labroides dimidiatus"
I figure he should do quite well in your setup. I think what you heard goes for smaller systems with little to no fish... or tiny nano's. i had mine for 3 years in my tank, gave it to my co-worker who bought my 90g. jumped out in his tank last week so we both mannaged to keep this wrasse over 4 years. yeah your tank is big enough to keep more tangs able to keep this wrasse well feed. some of it tends to eat everything you give it to, like mine pellets, flakes, etc..